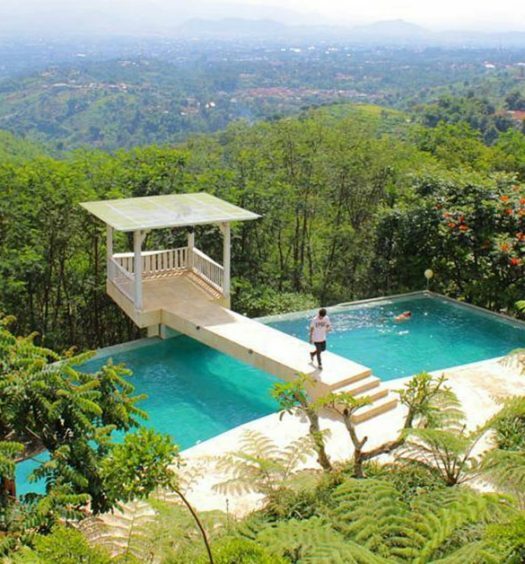 Looking for affordable travel destinations to head to with your partner? 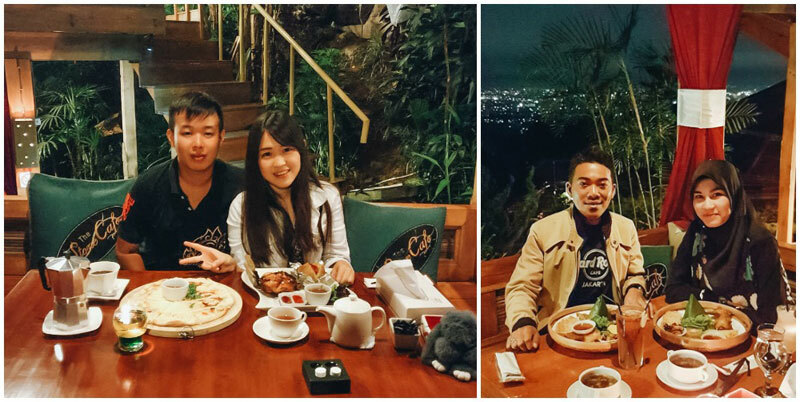 Bandung has got your pocket covered – while offering you tons of romantic dating spots to impress your sweetheart! 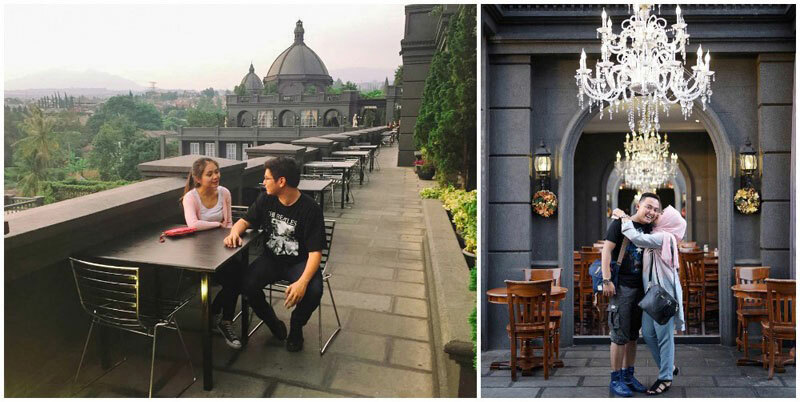 Just imagine, the two of you, dining in a European-style building, or even having an intimate meal under starry skies with epic city views! 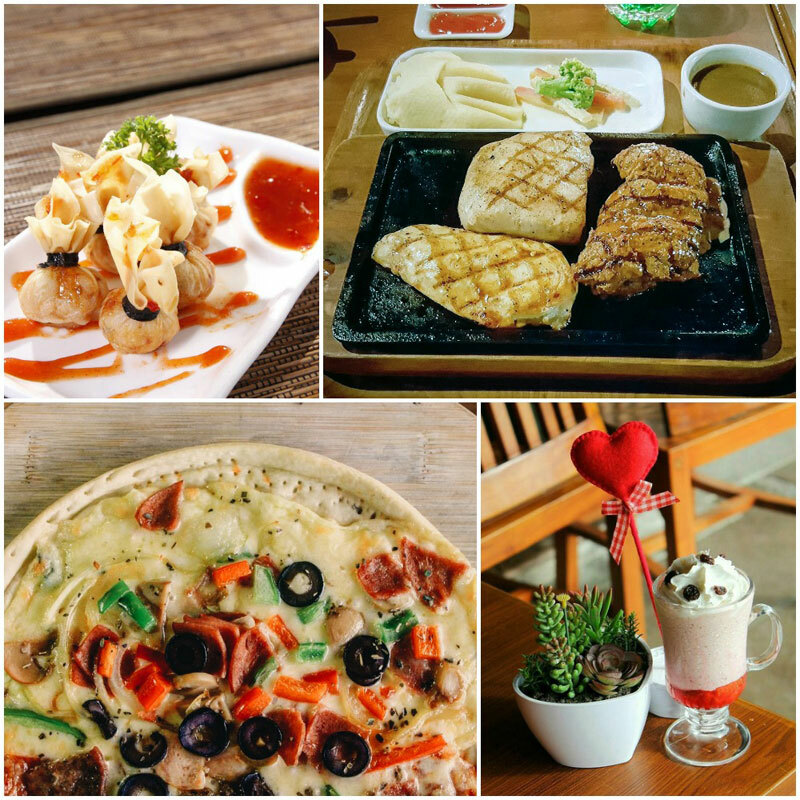 With the many recommendations below, there’s bound to be something for the both of you to have a romantic night out! The best part? 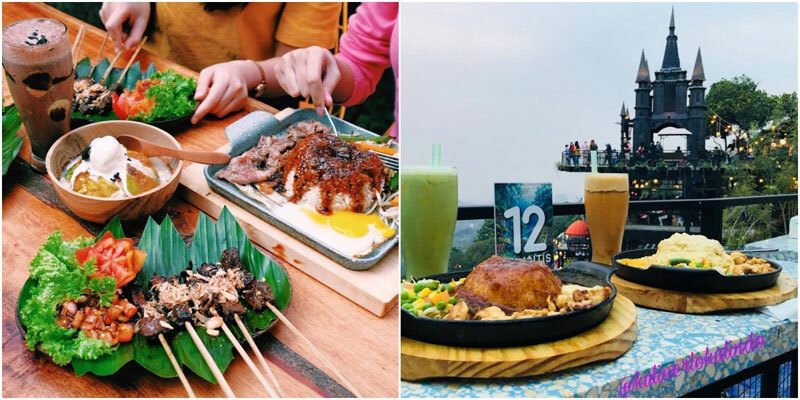 Our curated list of romantic restaurants will cost you less than USD$10 for at least 2 main courses, and are all located near the city centre (Braga) and Dago so that date nights get more convenient and budget-friendly! 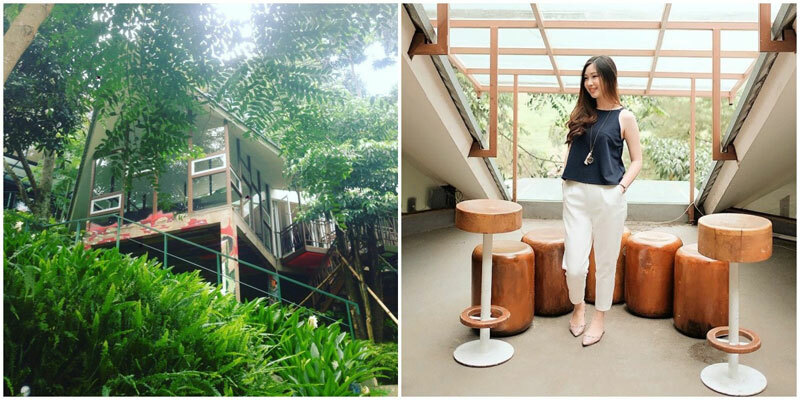 If your definition of an ideal date involves escaping from the hustle and bustle of Bandung city to have the ultimate nature retreat, Rumah Miring is the place for you. 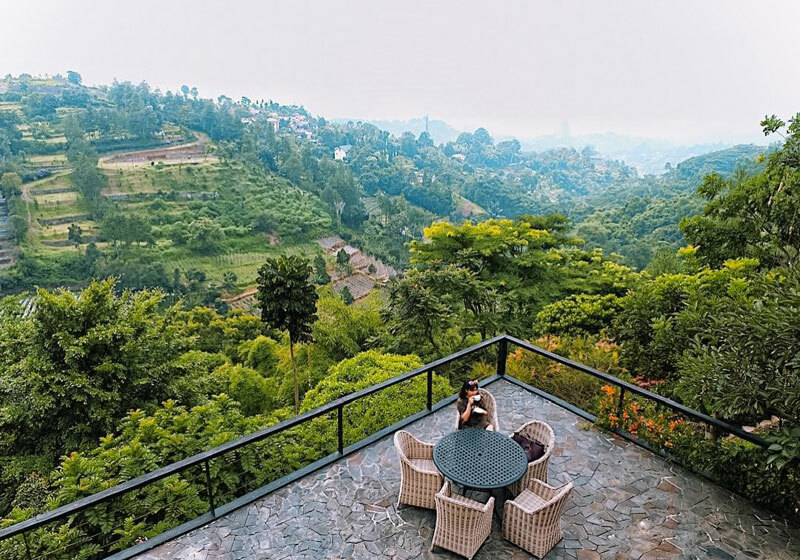 Rumah Miring is the ideal getaway for you to spend some quality time with your loved one in complete serenity while enjoying beautiful views of vast skies and greenery. Not a fan of formal indoor dates with the usual steak and coffee? 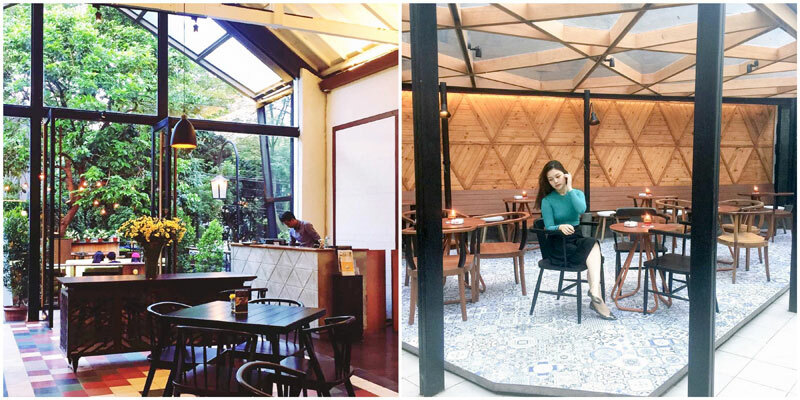 Here’s a place for a more casual and fun date outdoors: D’Pakar! 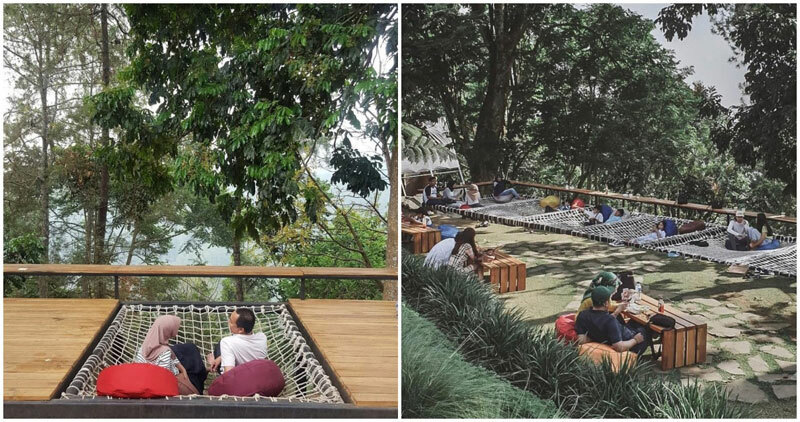 Enjoy a picnic here with your loved one, or simply chill at the hammock with some throw cushions! 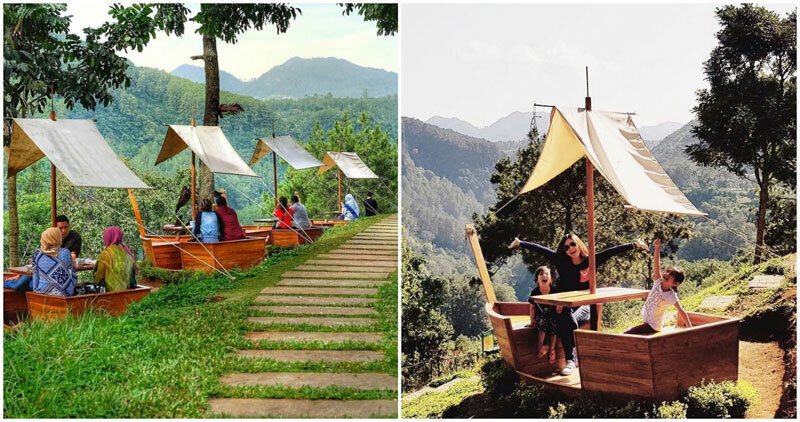 All the seating areas promise to give you hypnotizing views of the hills and lush green forest. TripCanvas Tip: Avoid long waiting times by reserving seats beforehand! Price: Mains start from Rp. 20,000 (approximately USD $1.38). 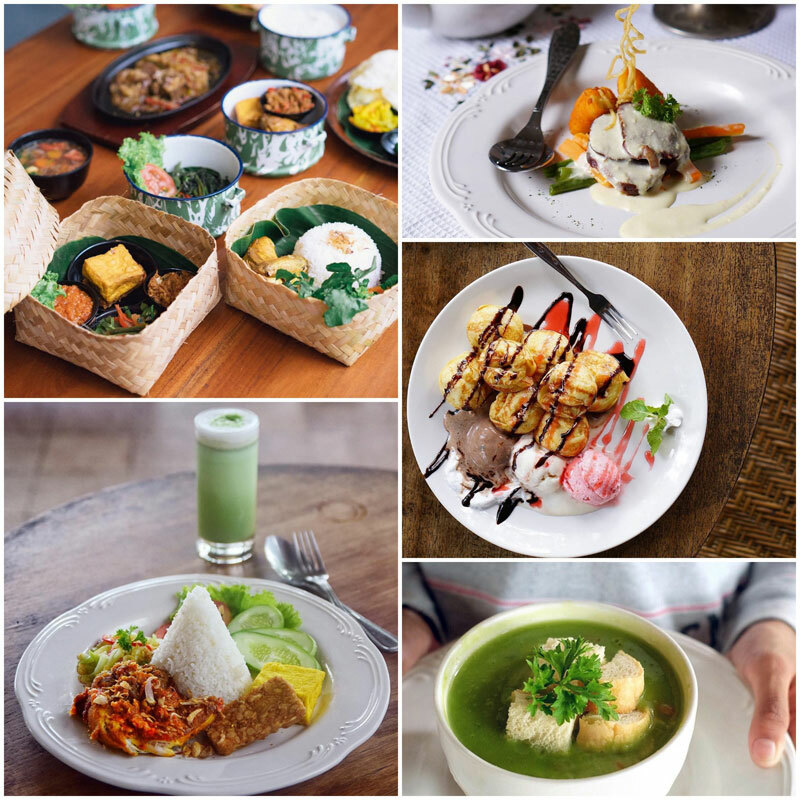 Minimum order of Rp 25,000 applies (USD $1.72). 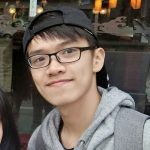 Calling all Instagram lovers! 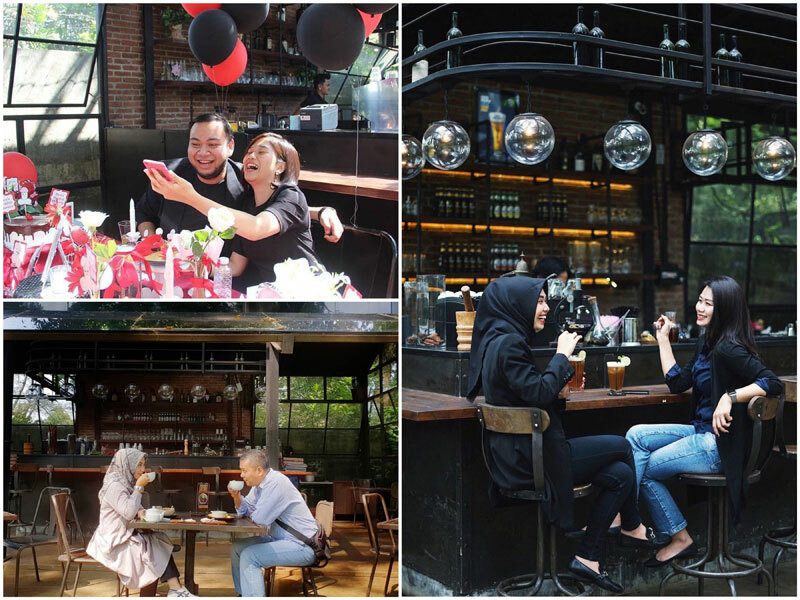 If you love taking photos to immortalize the sweet memories with your partner, Gormeteria is the place for you! 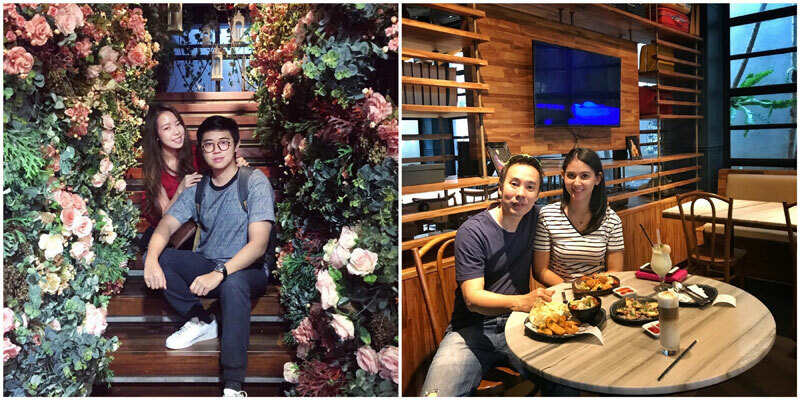 Be it posing with the giant toy gorilla or using the flower wall as a backdrop, Gormeteria is simply an Instagram wonderland for couples to play around and experiment with their creativity! 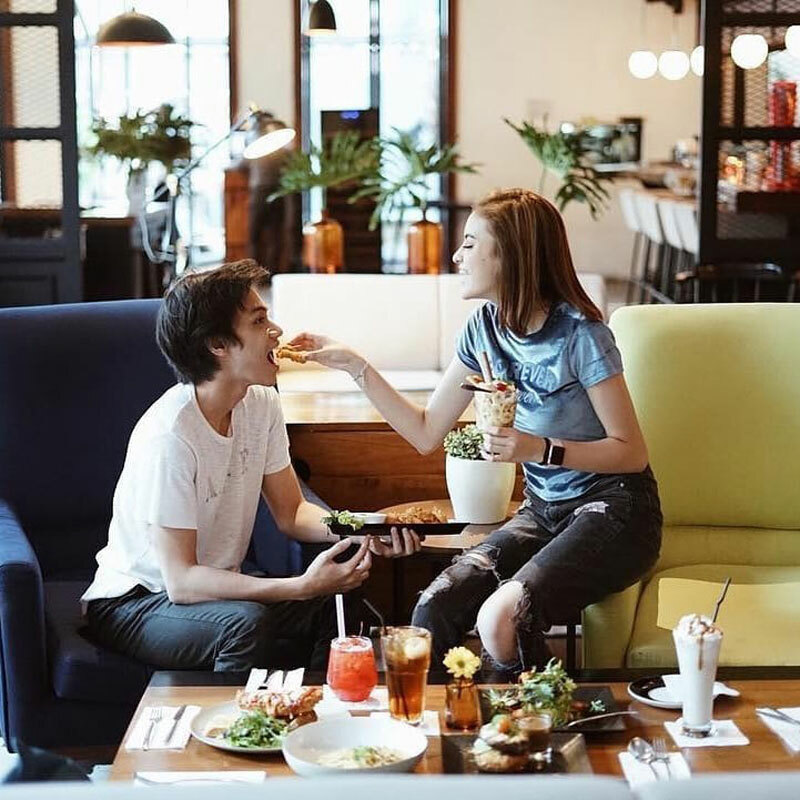 Once you’re done snapping away and would like to settle down for some food, let the classy and romantic ambience within the restaurant take over for some private time with your loved one. 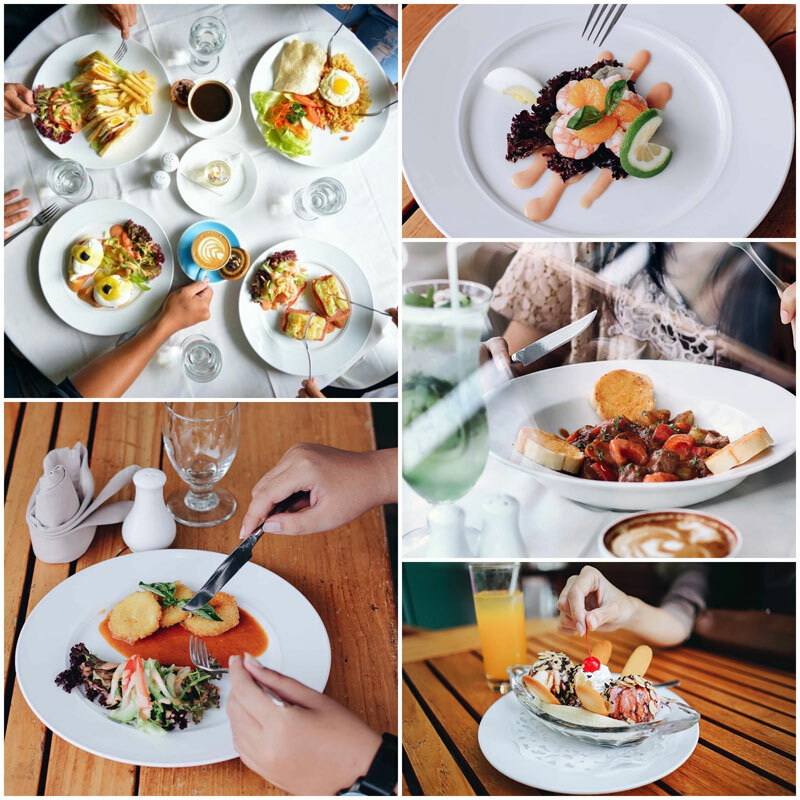 The food served here makes a feast for the eyes, as much as it is also a feast for your bellies! The Salmon Steak and Patatas are great for sharing, and their desserts like Thai Tea and Milo Layer Cakes taste just as good as they look! Romance doesn’t always have to involve candlelit fine dining. 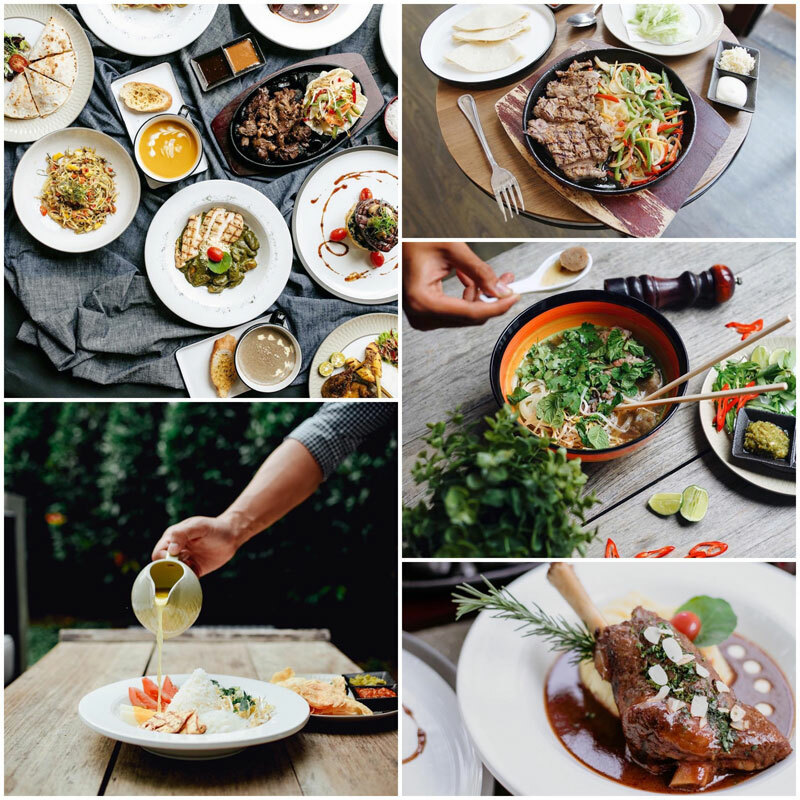 For a intimate, cosy lunch with your loved one, Wild Grass is a great dining option. The vintage industrial interior exudes classy and secretive vibes with great romantic lighting to give couples a sense of privacy. 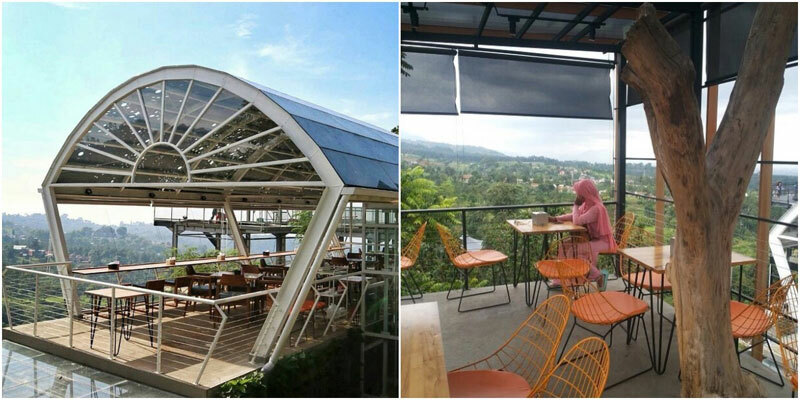 The spacious yard at the front is also another inviting hangout spot for the two of you to enjoy Bandung’s cool breeze! 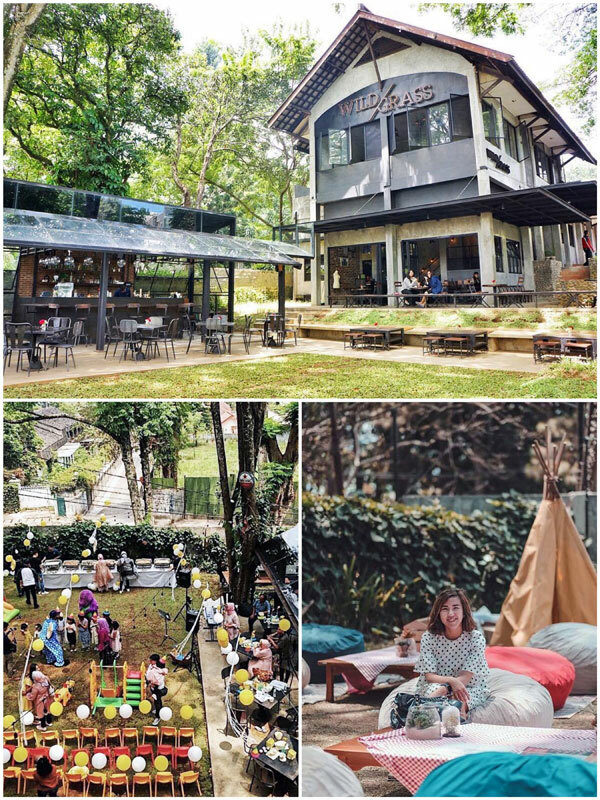 At night, the area can be lit up with campfires and live entertainment to make date nights even cosier! 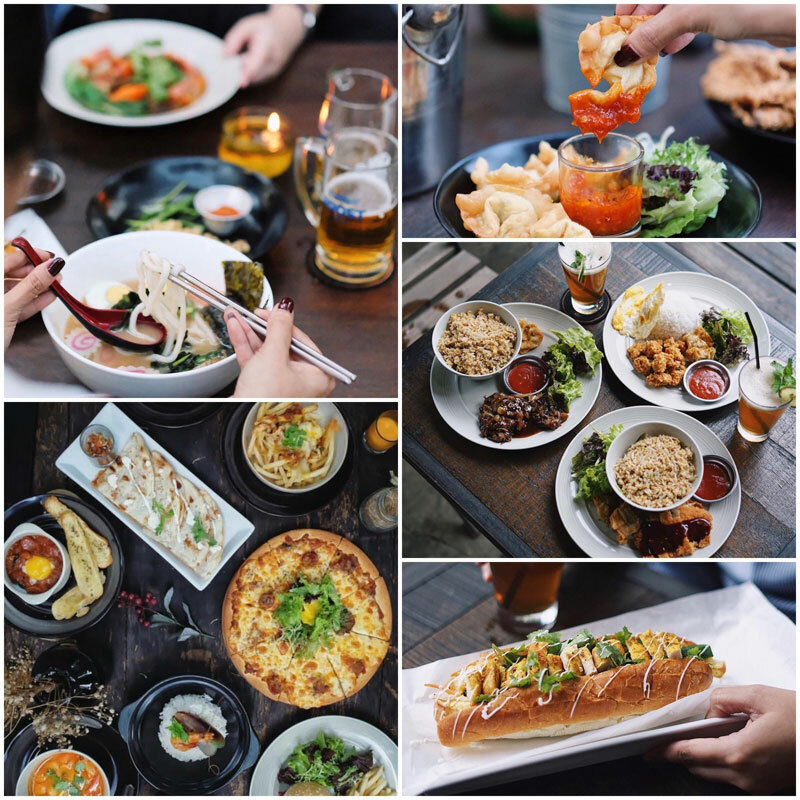 Whether you’re dropping by for a snack or a meal, the food will definitely impress your bae. 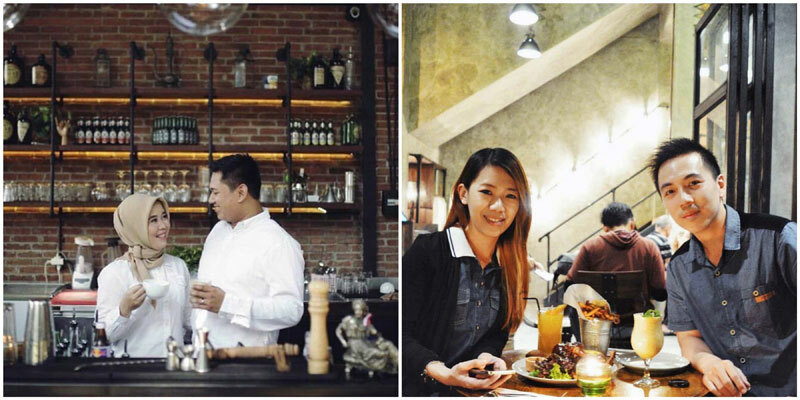 Try the chicken wings and pasta here to see why they are so well-loved amongst patrons! Taking your loved one out for a dinner date in Santorini is no longer a dream! 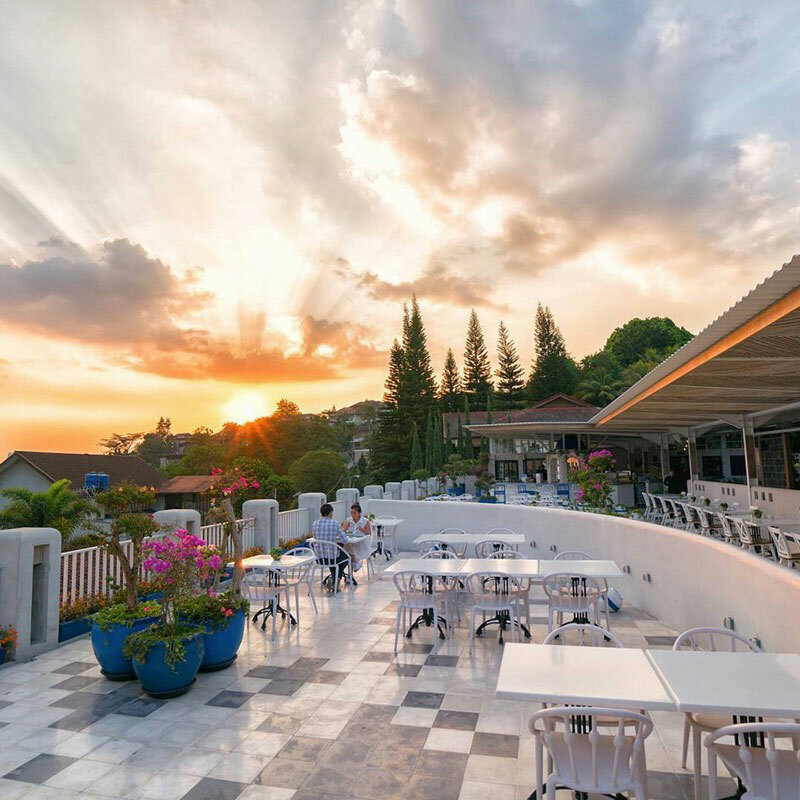 At Orofi Cafe, the iconic blue and white hues of Santorini are replicated to recreate the dreamy lovers’ destination right in Bandung! 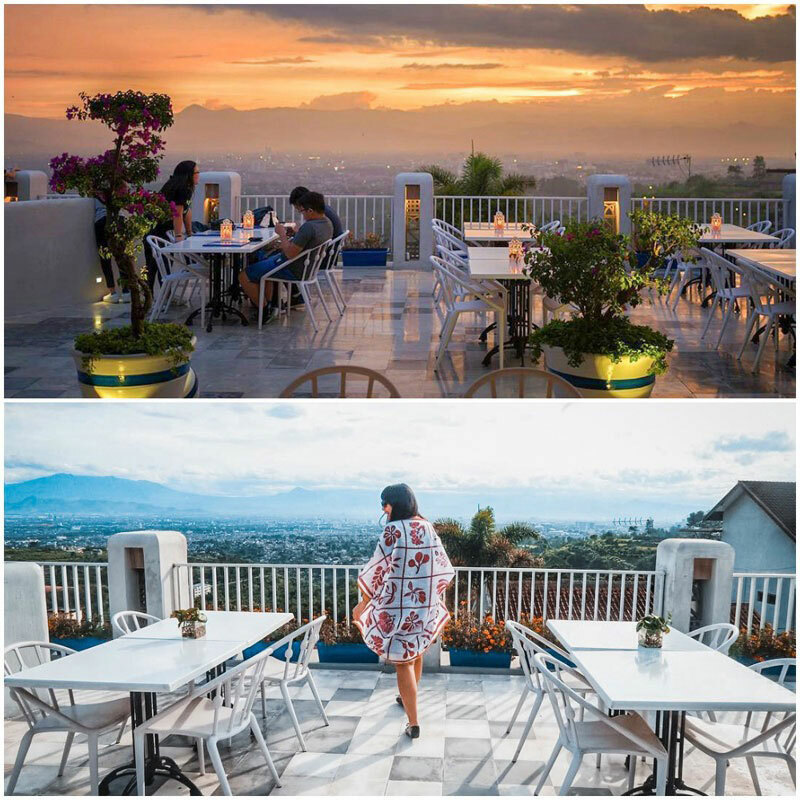 To make it even better, the restaurant overlooks the city, which looks extra romantic during sunset, with the sun slowly fading behind the mountains in the orange-pink sky. 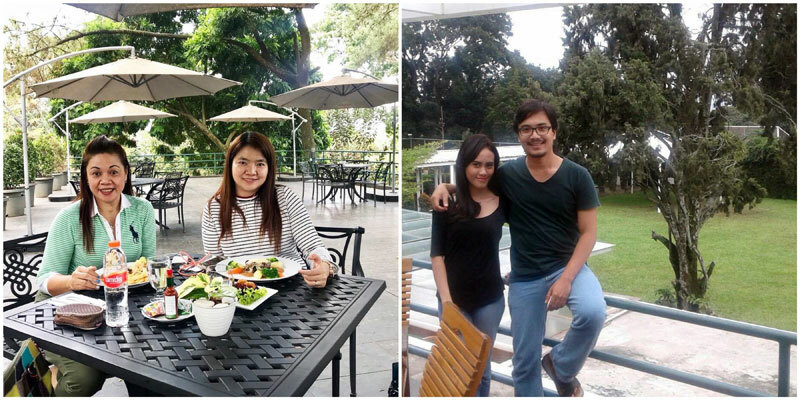 Their Beef Wellington and the Orofi Omelette is a must-try here! To finish up the meal, you could also satisfy your sweet tooth with some exquisite desserts like the Panna Cotta or Matchagato! Coffee lovers at heart will love this place, where they offer the most adorable 3D latte art! 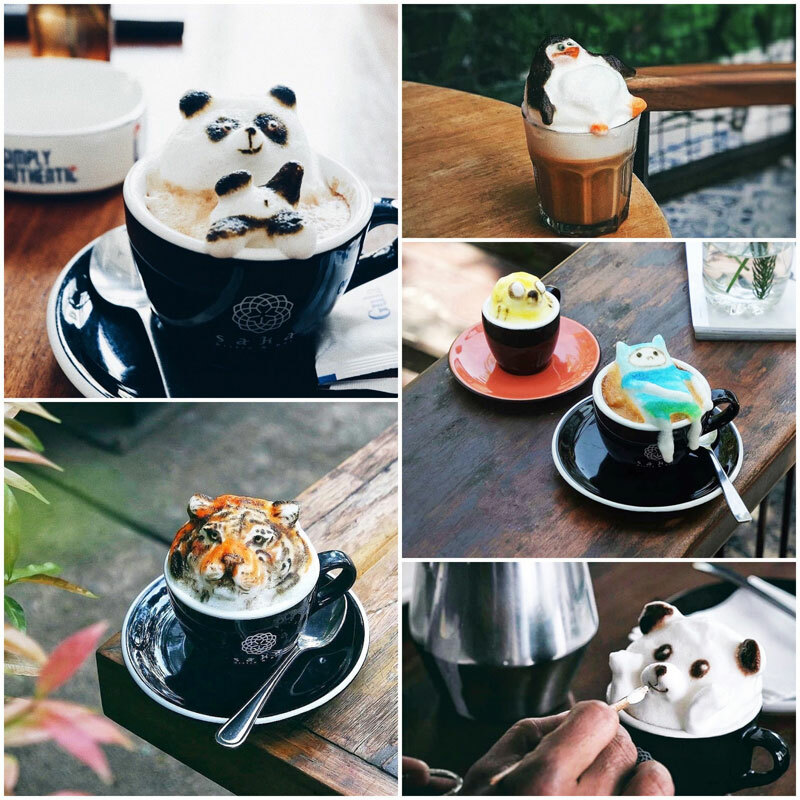 From cute animals to iconic cartoon characters like the penguins from the movie ‘Madagascar’, the creative lattes will make you and bae’s afternoon a little sweeter. Apart from the cute latte art, the food here is fantastic too! 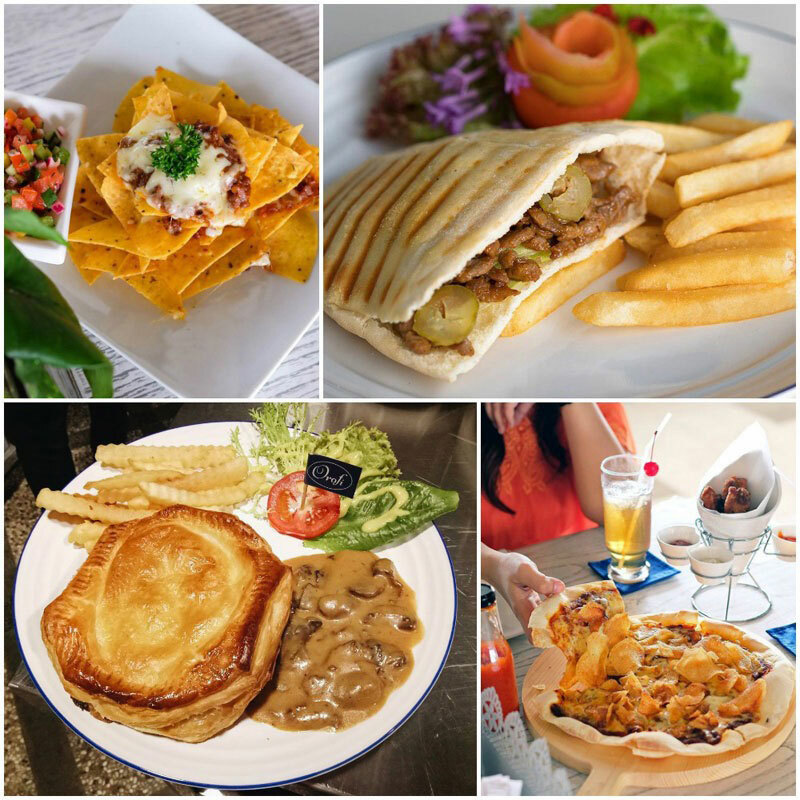 Some favourites include the Jyu Jyu steak and Chicken Quesadilla that has some patrons raving nonstop about it. 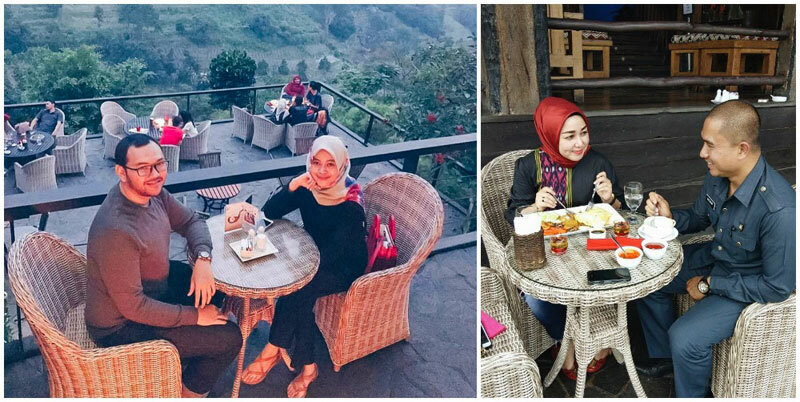 If you’re dropping by at night, you could also opt for the outdoor seating area for a more romantic experience. 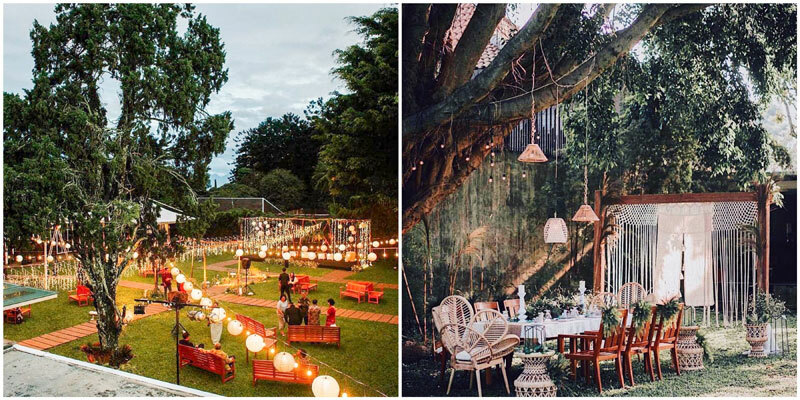 The warm lighting amidst the flora and fauna creates a mysterious and intimate atmosphere to up the romance factor! Address: Jl. Karangsari No.2, Pasteur, Sukajadi, Bandung City, West Java. Having a romantic dining experience with your partner outdoors sounds almost like a dream, especially when you’re on a budget. 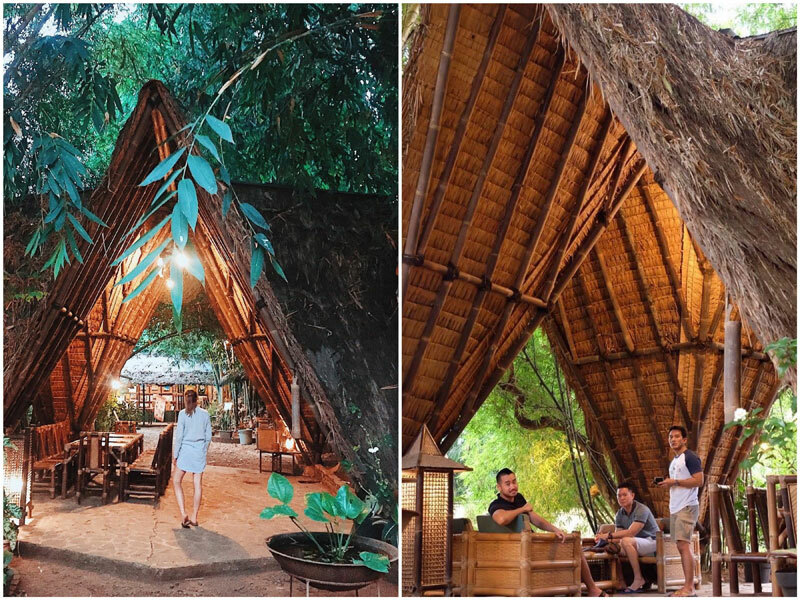 However, your wish can be fulfilled at Kebon Awi, where there are 10 personal dining huts surrounded by the bamboo forest consisting of 25 bamboo species. 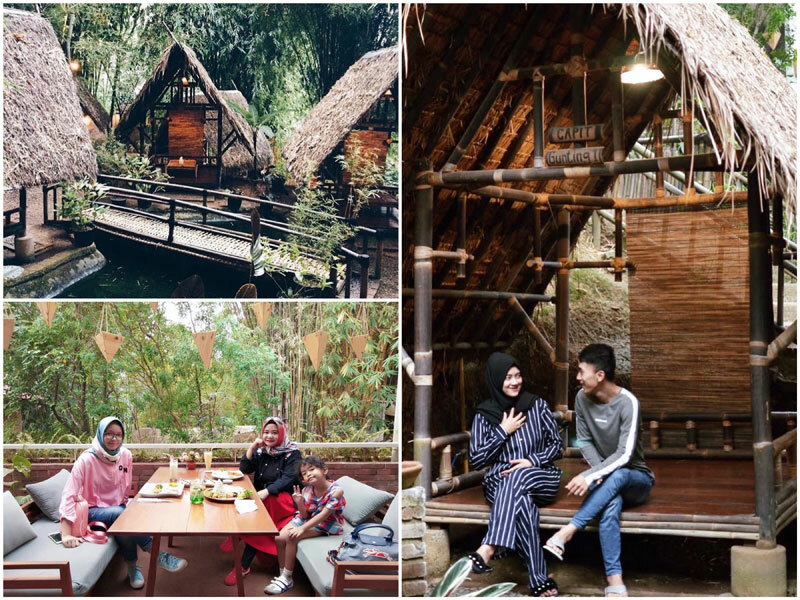 Within your own personal hut, the two of you can also enjoy Sundanese culture and art performances (available every weekend) to make your dining experience extra memorable! 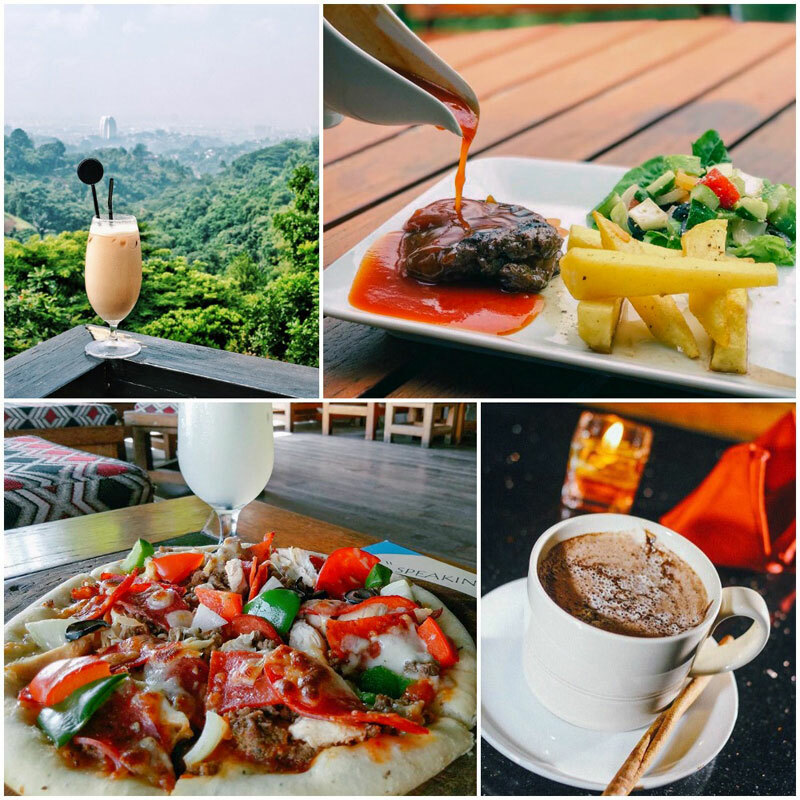 You wouldn’t want to miss out on the Bamboo Shoots here, but the Chicken Haur Hejo and the specialty coffee drinks will definitely be the top highlights of your meal! 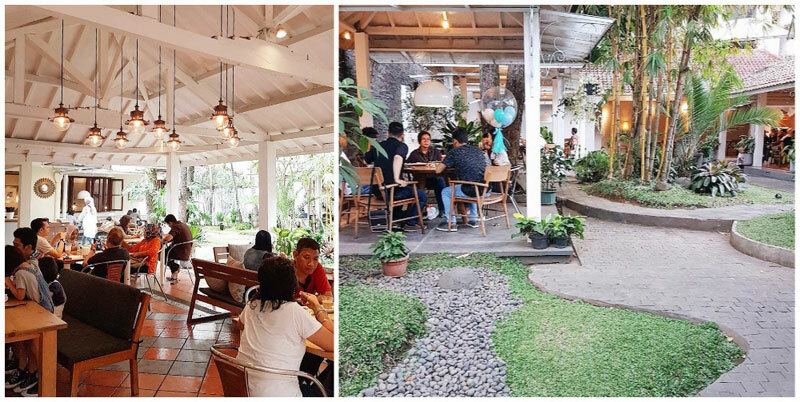 Living up to its name, Warung Salse (Salse means ‘relax’ in Sundanese) hopes to let lovebirds spend time in a world of their own, away from other distractions. 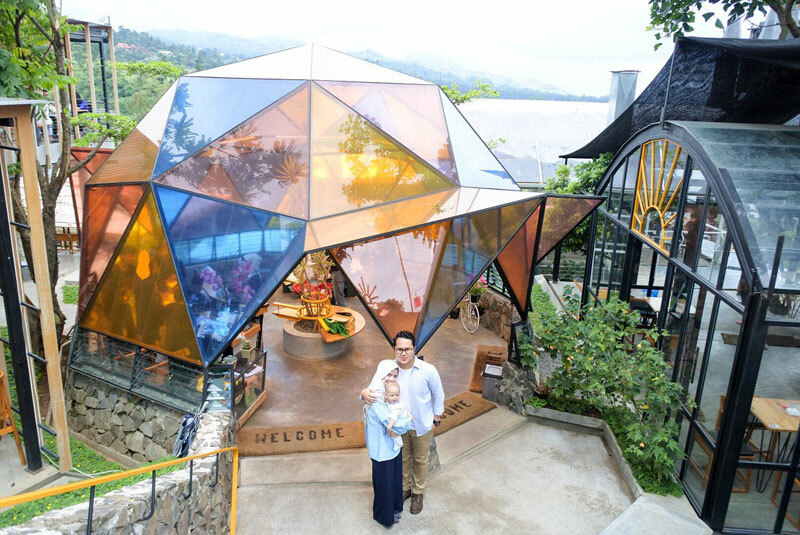 Unwind from the hectic routines with your partner as you sit by the beautiful stained glass windows, or go for a walk in the forest while taking in the cool fresh air of Dago! The Spaghetti TekTek here is one of the highlights made up of a fusion of local flavours into the Italian dish. 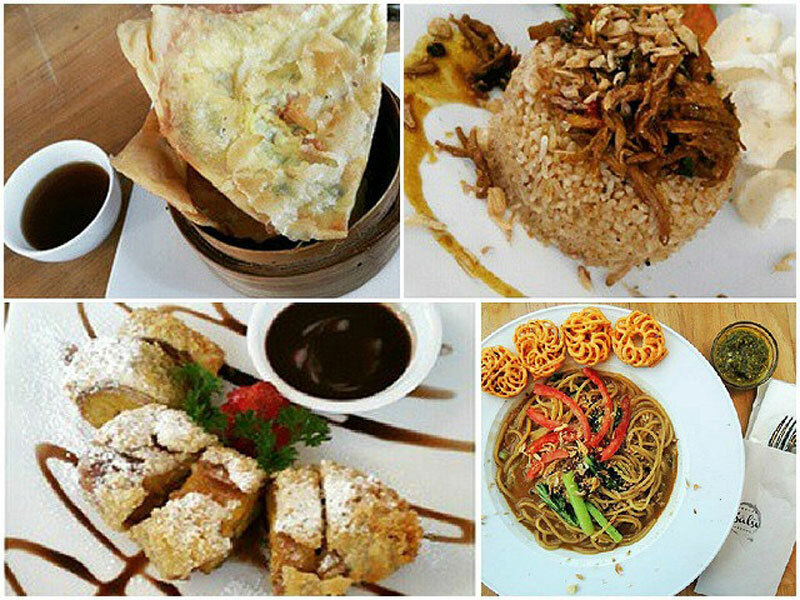 You can find mainly Indonesian delights here, though. Address: Jalan Dago Giri No. 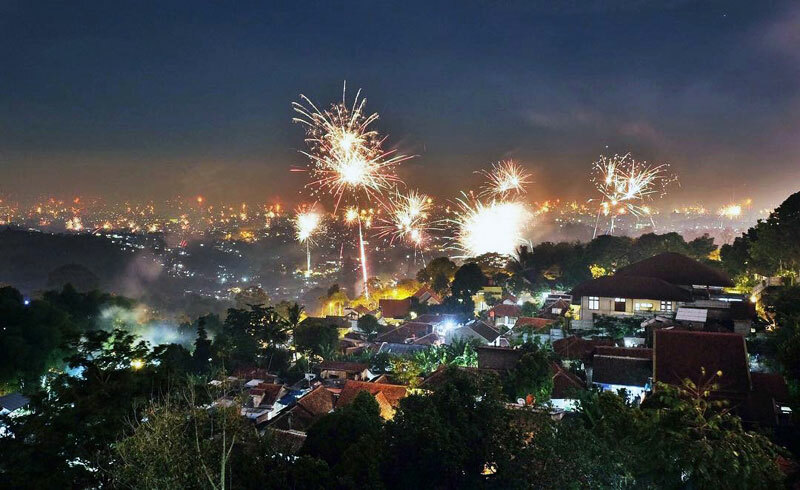 101, Lembang, Bandung 40142. 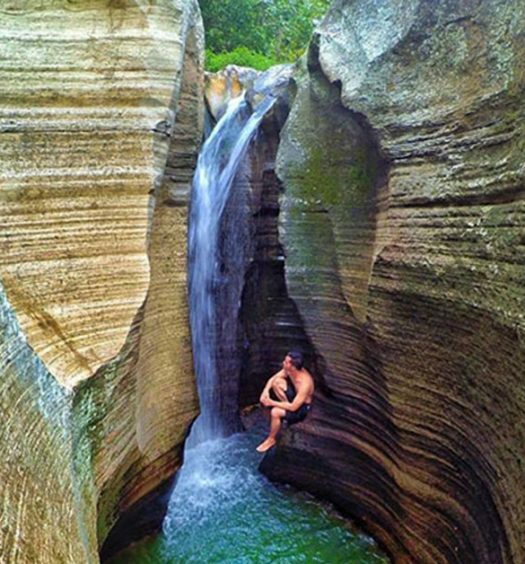 Amazing scenery? Check! Pleasant ambience? Check! Scrumptious food? Check! 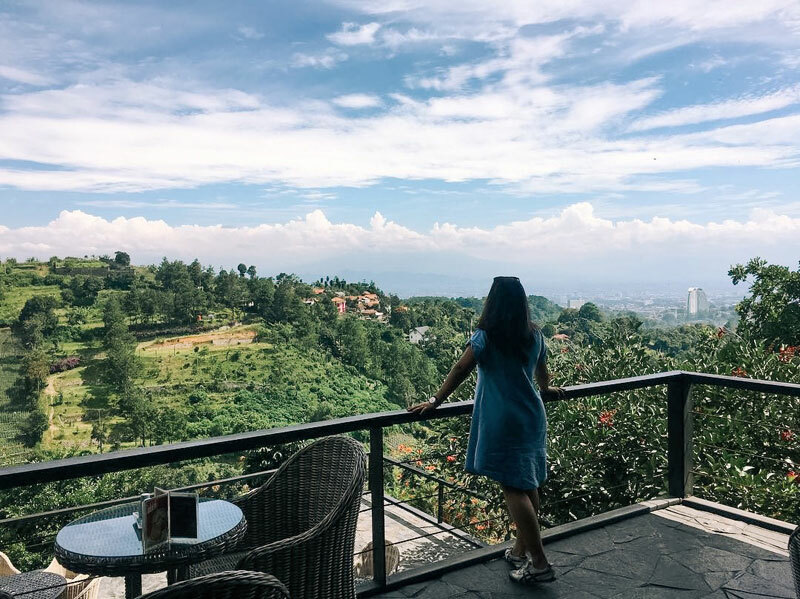 At The Stone Cafe, you can enjoy the sparkling city views of Bandung from afar while having a private and intimate moment with your special someone. 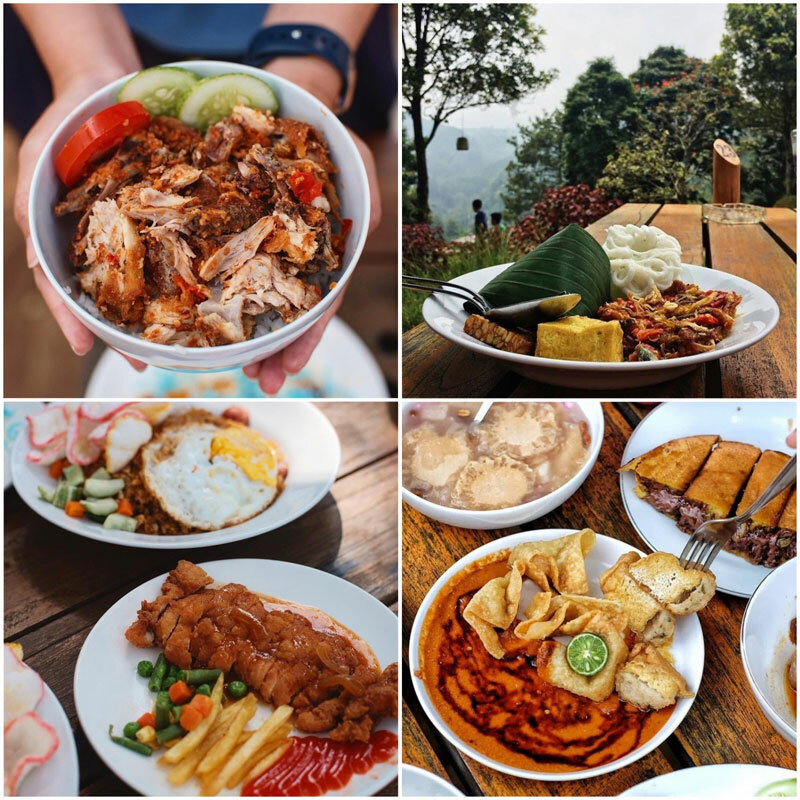 Go local with their Nasi Goreng, or try out their Western dishes like steak or pizza – both great food choices to complement the great view that the restaurant offers. The atmosphere is made even better with the live music available every night, setting the mood for a romantic evening! Getting ready to start your lives together? You and your beloved can start throwing out ideas for your wedding at Maxi’s. 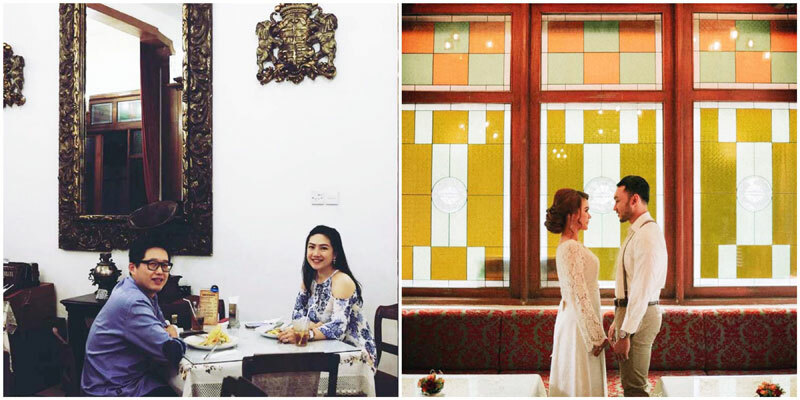 Maxi’s isn’t just a romantic dining place, but also a fantastic wedding venue for many couples who have chosen to hold their big day here. 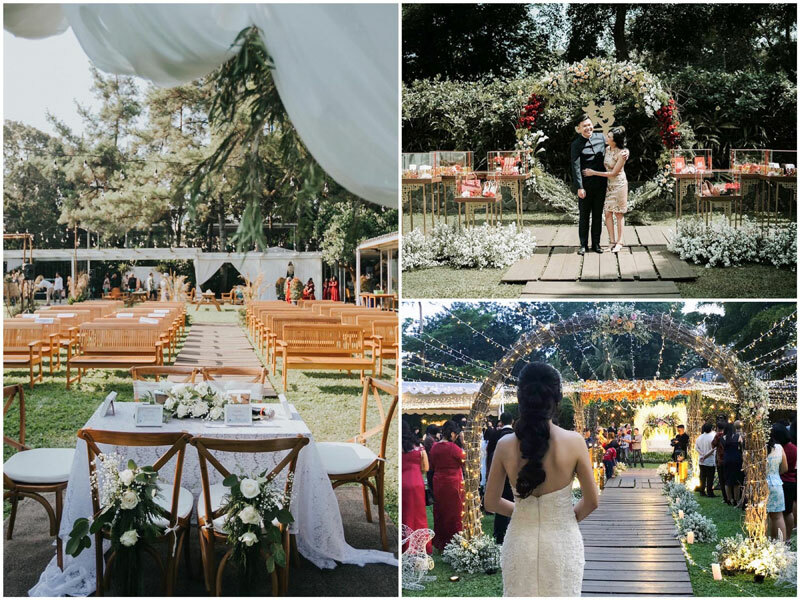 The pleasing outdoor view allows for many possibilities on how a dreamy wedding can be held, so you can start planning for the big day under the romantic ambience! 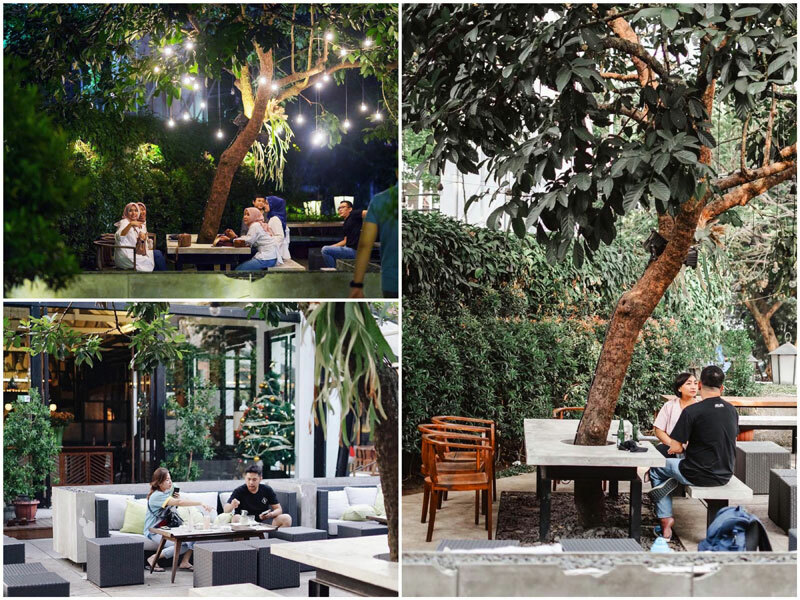 The endless greenery from the restaurant can also soothe your mind and let you enjoy some romantic time with your partner. 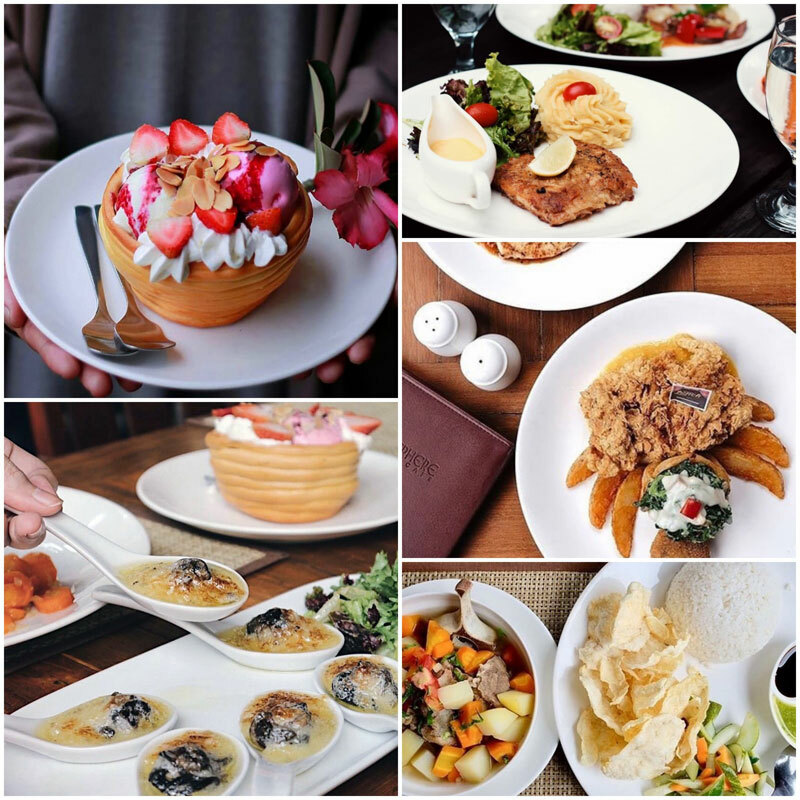 Foodwise, Maxi serves up some of the best Goulash Soups Chicken and Chicken Valdostana in the city – both recommended dishes that you absolutely must try while you’re here! 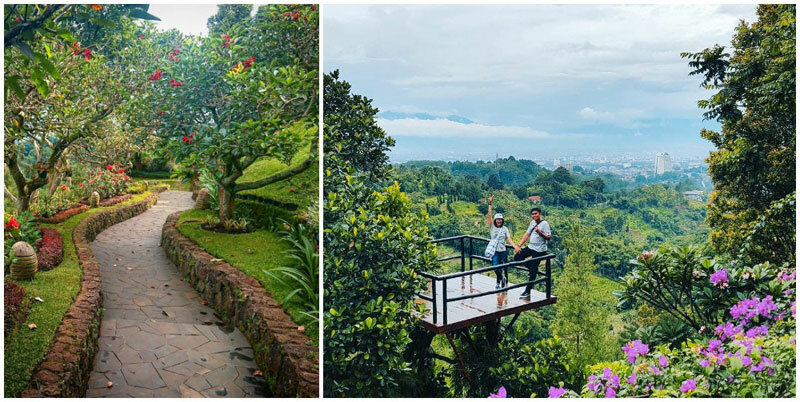 Regardless of whether you are planning to have your wedding at Maxi’s or not, couples will love the alluring scenery and ambience here that will make your trip even more special! 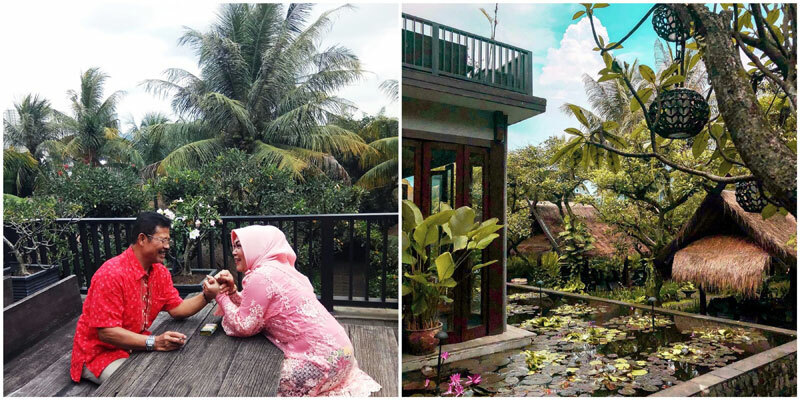 Imagine strolling hand-in-hand through a mini garden with your beloved, enjoying the view of a lotus pond, accompanied by good food and the fragrance of tropical flowers. 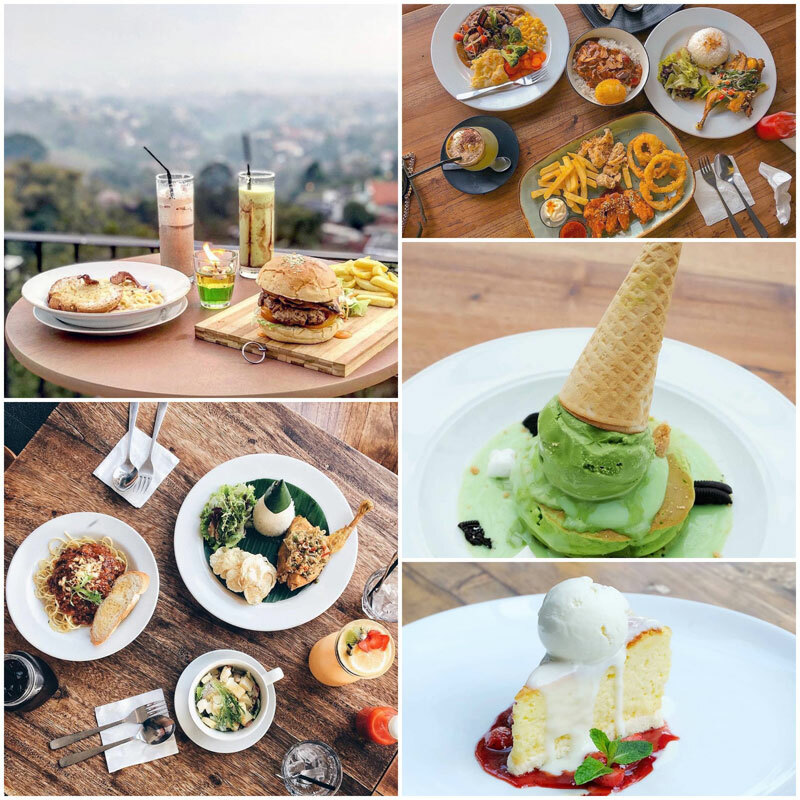 If that sounds great to you, Atmosphere Resort Cafe is a must-go on your trip to Bandung with your partner! 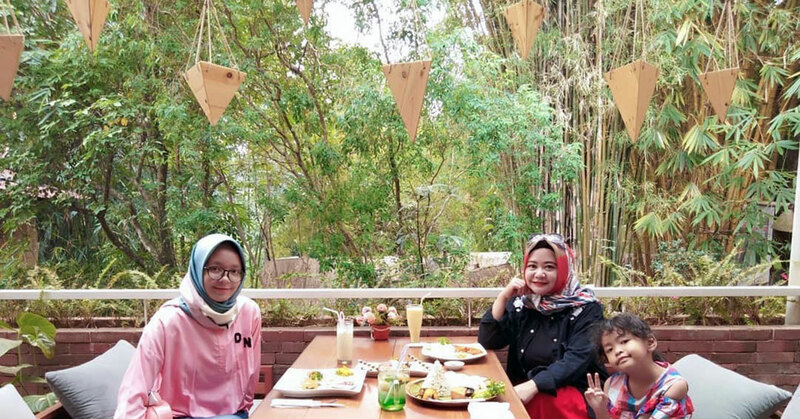 A Balinese restaurant set in Bandung, the restaurant has cosy and relaxing tropical vibes, evident from their quaint woody interior, and relaxing nature surrounding the place. 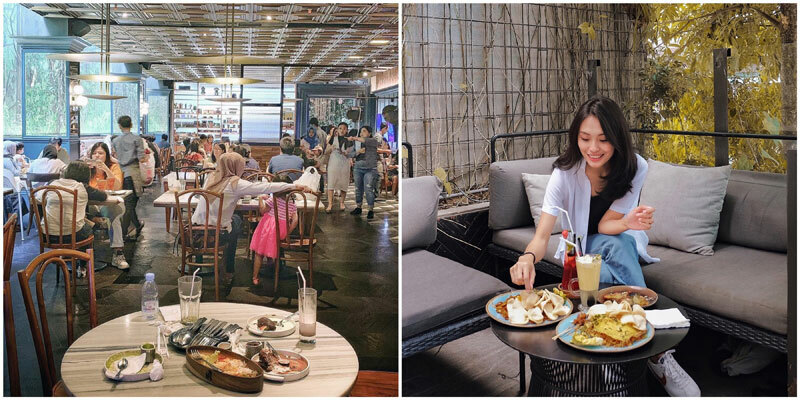 Whether you are looking for local delights like Nasi Campur, or classic romantic dishes like steaks, there’s definitely something on the menu to satisfy you and your partner’s tastebuds! 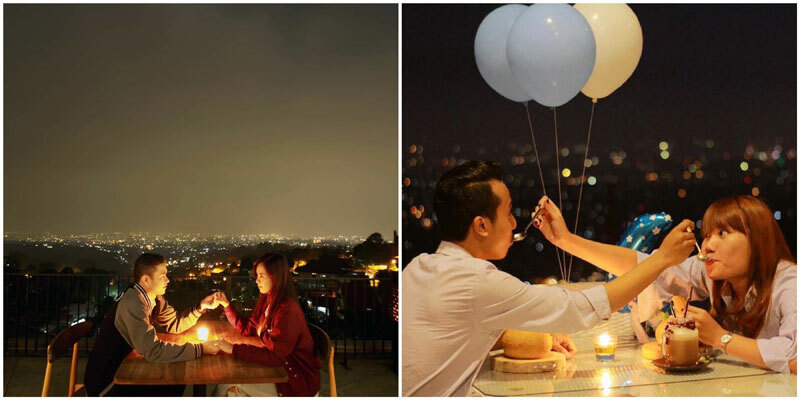 Nothing is more romantic than having a candlelight dinner while overlooking the city skyline – the perfect dinner date that everyone dreams of! 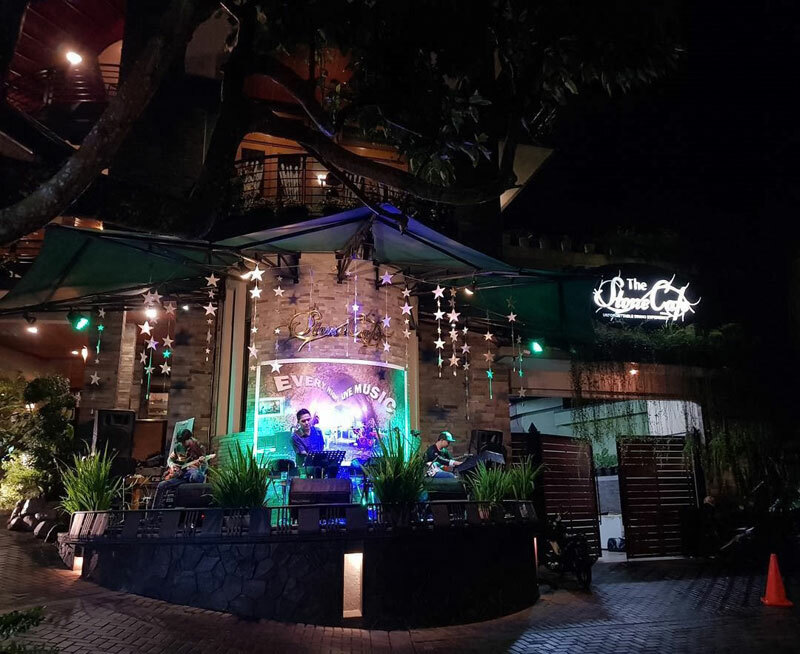 Sierra Cafe and Lounge is your best bet if you want to impress your bae on your special night out. After all, how can she say no to the stunning views here? 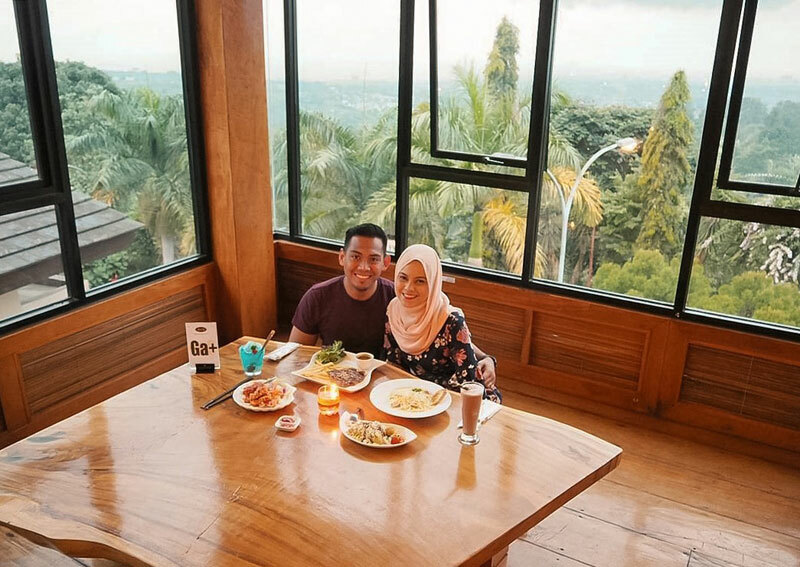 Besides the exclusive scenery, you can also be assured that the menu goes well with the romantic atmosphere, with dishes such as the Spaghetti Aglio Olio or the Salmon! 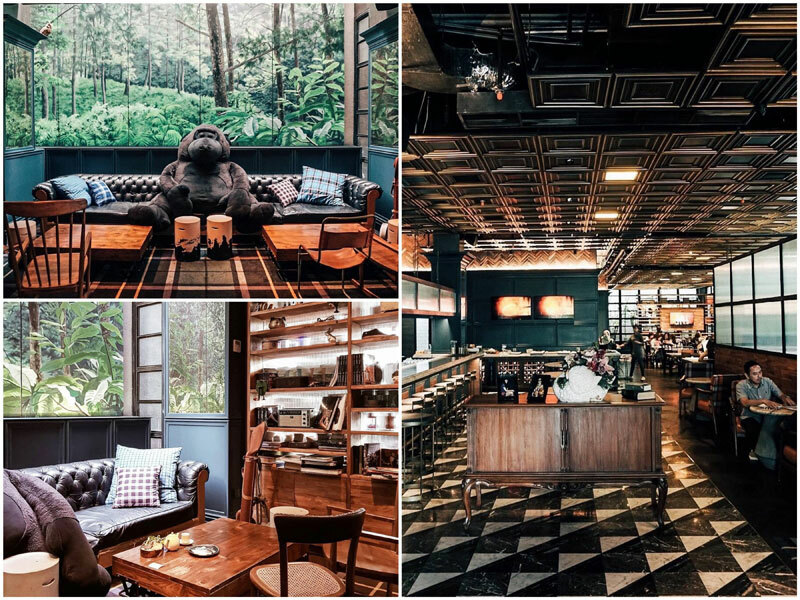 For your next romantic night out, how about travelling back in time and spending some quality time with your partner in a restaurant set in a old colonial bungalow from 1910? 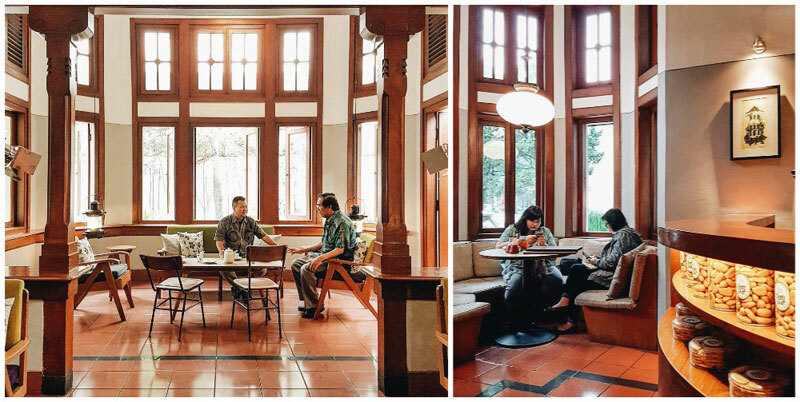 Besides its colonial exterior, Dakken’s vintage interior promises an unusual dining experience where you and your loved one can feel like royalty. 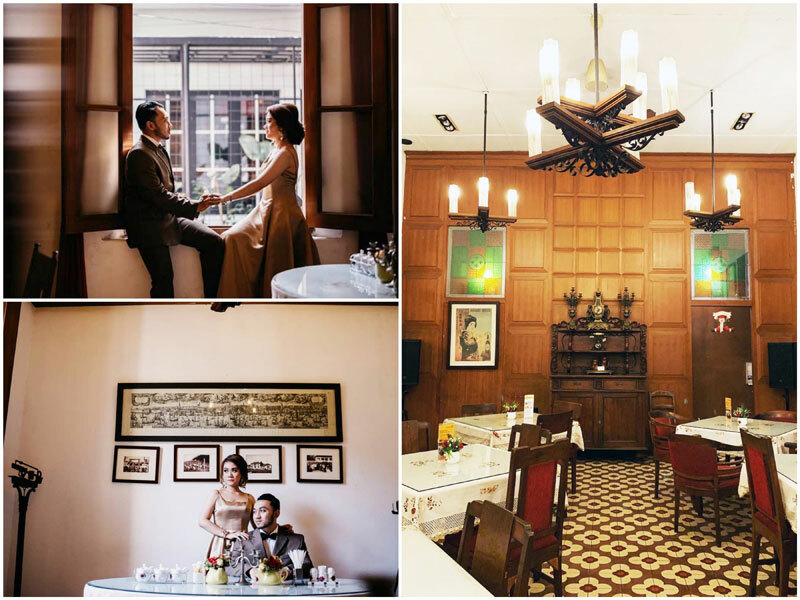 Inside, you will find exquisite teak furniture, classic burgundy-tiled floors, and romantic white brick walls – all defining characteristics of charming colonial buildings that adds to the romantic ambience. 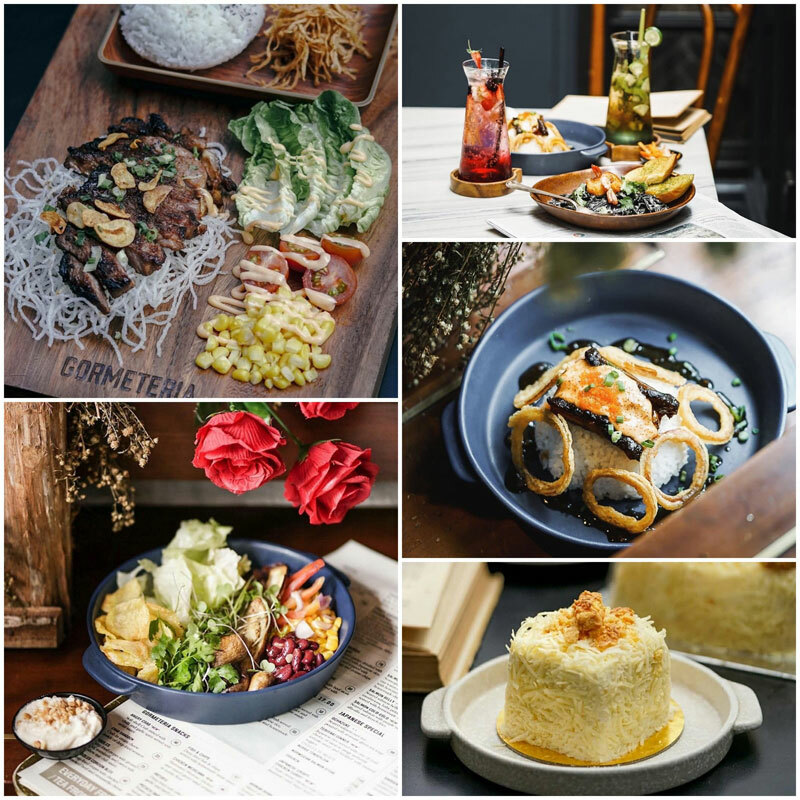 When it comes to the food, you might want to try the Sup Buntut (oxtail soup) and top it off with their scrumptious chocolate lava cake! 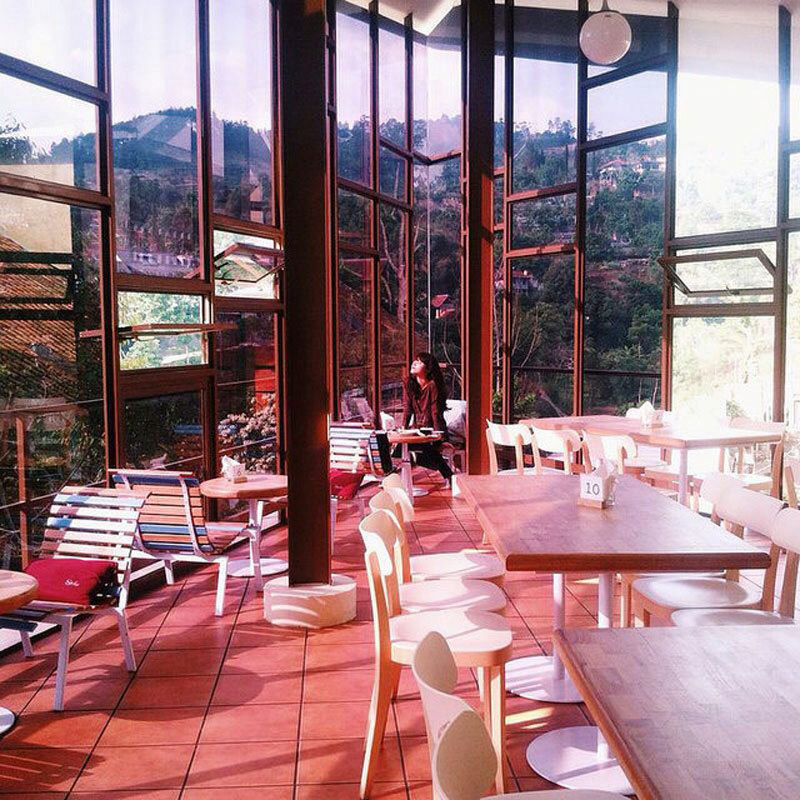 Prefer to have your cuppa outside? 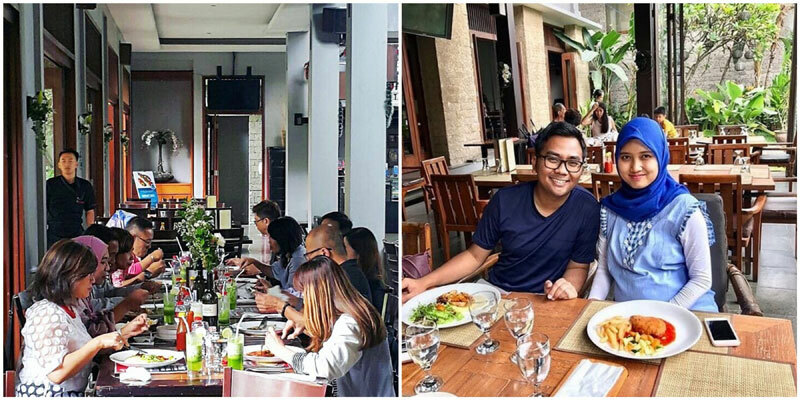 You can also opt for the outdoor seating, where you can admire the garden view and architecture style while enjoying an intimate meal with your partner! Your date will love to be treated like a king or a queen at Belle Vue French and Italian Bistro! This romantic restaurant offers guests real European luxury complete with chandeliers and mountain views – a real treat for your beloved who deserves the best in the world! The royal treatment doesn’t just stop at the decorations. 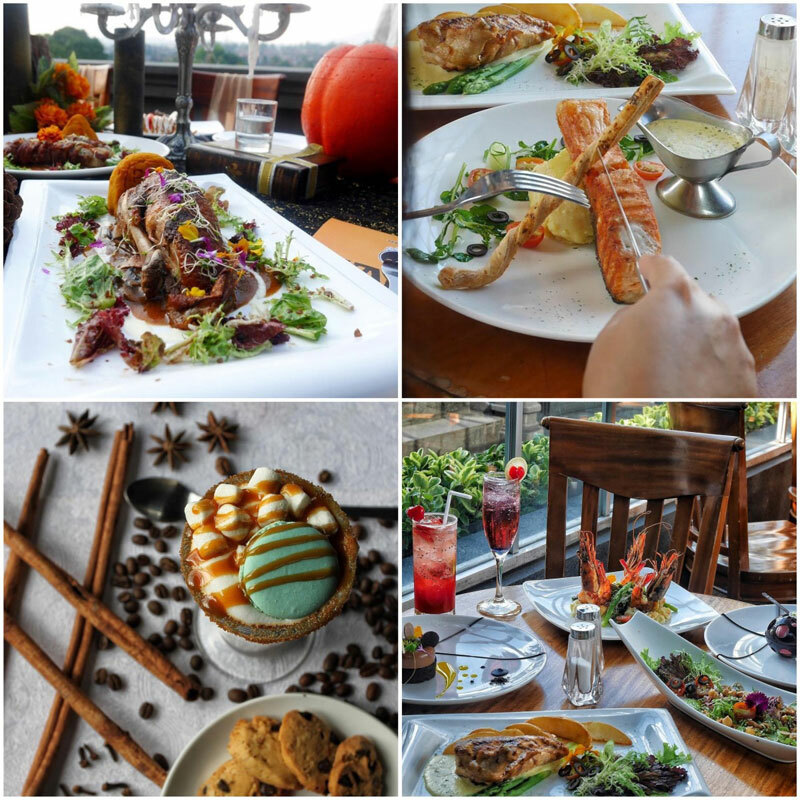 You will be attended to by the chef who will prepare mouthwatering delights like the Poulette A ‘A Bierre, Tenderloving Beef, and Chocolate Zagablione – all wonderful dishes that will excite you and your partner throughout the night! Be sure to come in the evening to enjoy the sunset view while dining like royalty atop this German-style castle! 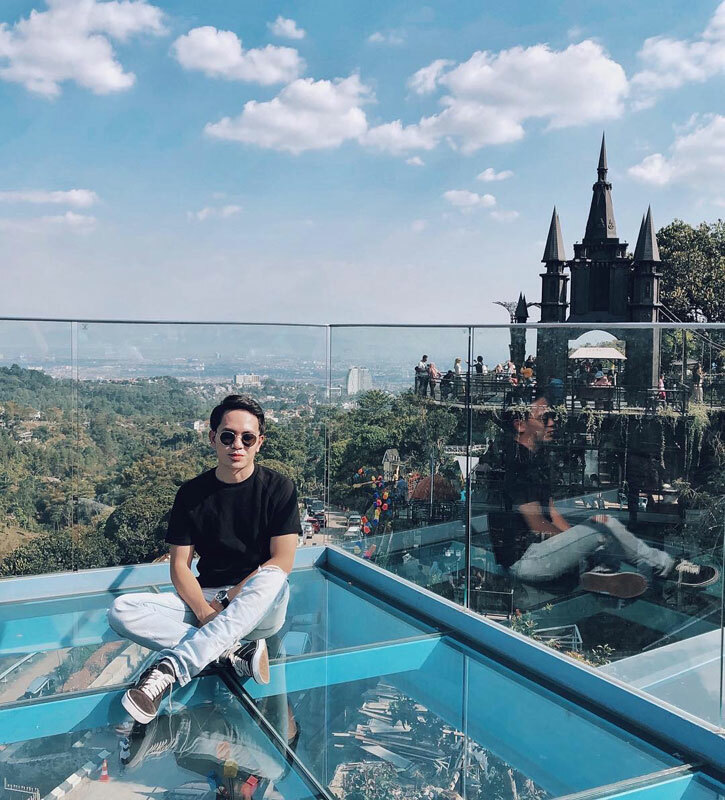 If you’re celebrating something special, you might also want to opt for the romantic rooftop dinner at the Chapel of Angels, where you could dine in a more private setting while overlooking the city. Have you ever wondered what life was like in the Dutch East Indies era? Now you have the chance to experience it with your partner! 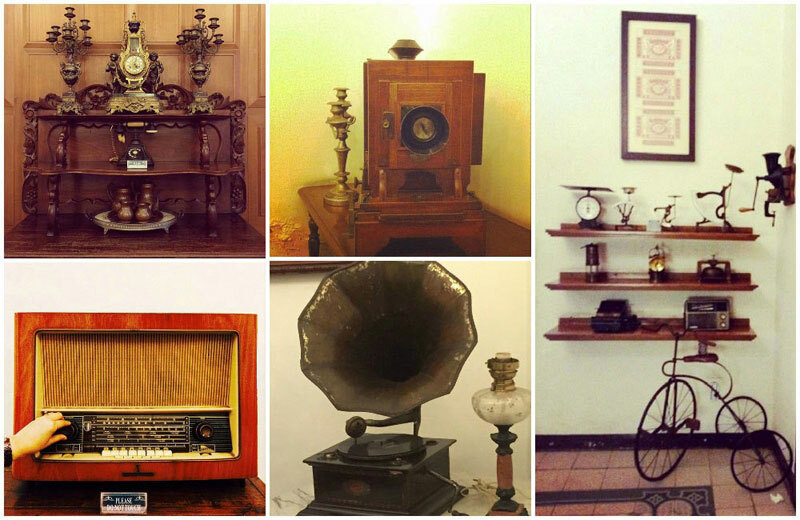 The wonderfully historic Indischetafel will give you insights on how the rich dined during the colonial era. 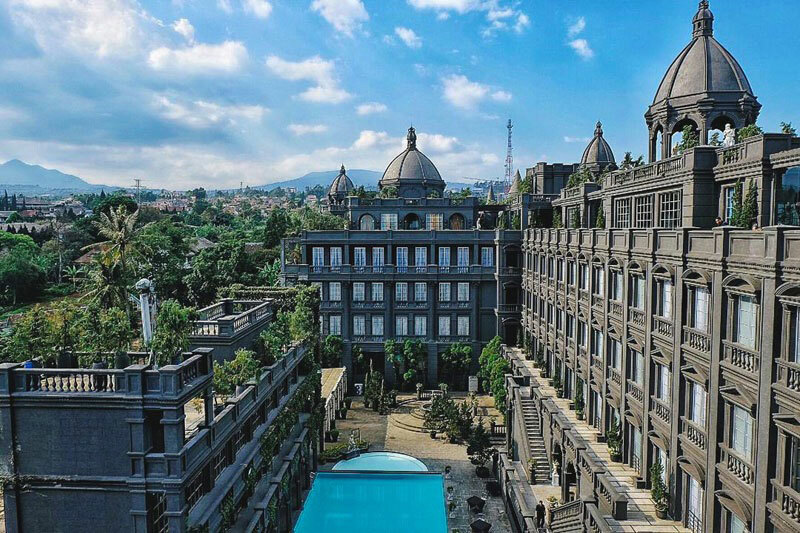 The tasteful blend of antique European-Indonesian decorations in the restaurant recreates the era to give you the ultimate history experience! The food at Indischetafel is just as historical as the decor. 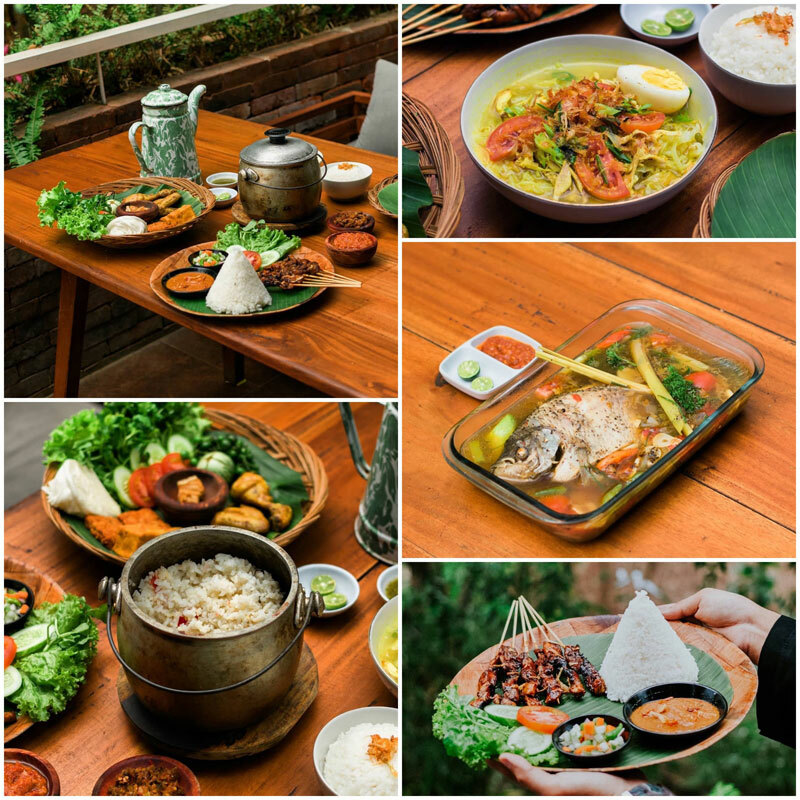 Be sure to try the Lidah Saos Kedjoe, the Sour Ox Soup, and the Tahoe Garem Pedes – all dishes that were well-loved since the past! Running out of ways to impress your bae? 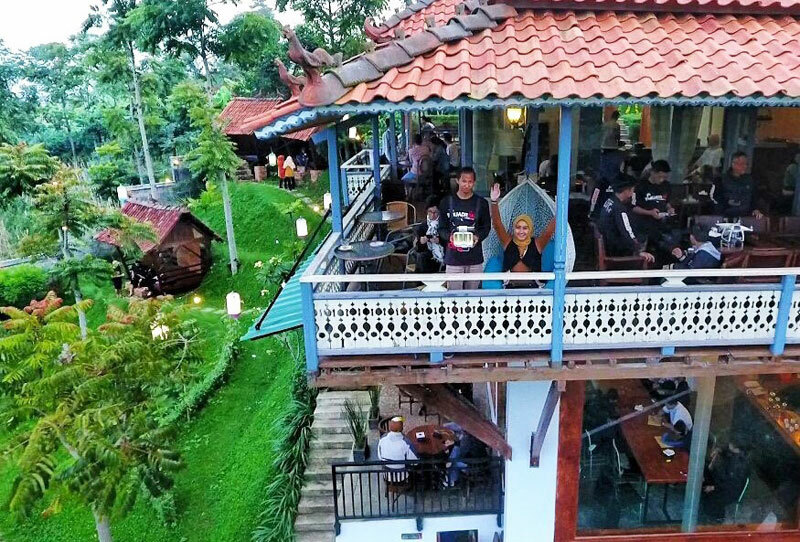 Introducing to you Cakrawala Sparkling Restaurant! You and your partner can have a magical dining experience under the ‘stars’ in the galaxy room when the sun shines through the specially-designed rooftop to simulate the gorgeous night sky! 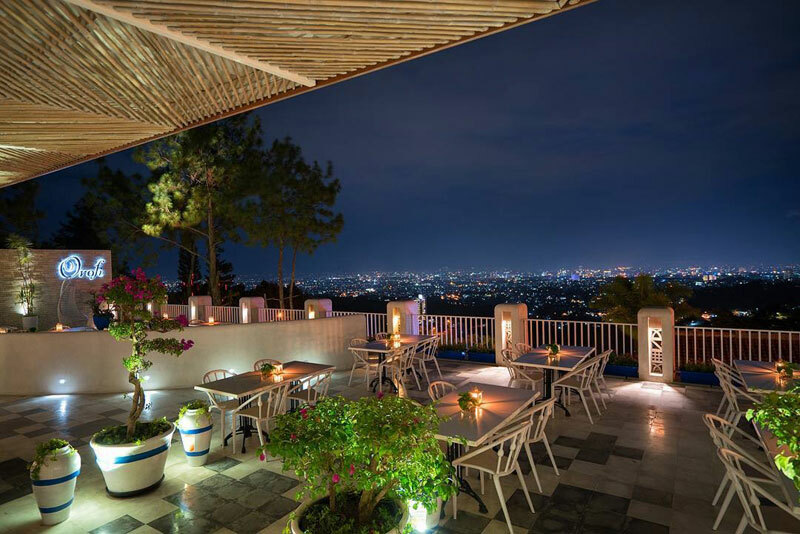 For a real night-time view, you can opt for the outdoor seating area at night where you can dine with your beloved under the stars and twinkling city lights. What’s more, you will even get to admire a coloured glass dome and an unusual castle gate in the area to make your meal even more romantic! 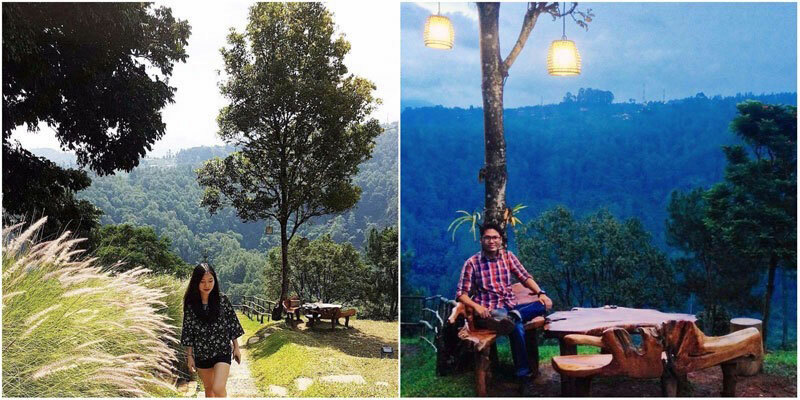 The view might be great but so is the food – the Rice Hotplate and Steak here will wow you and your partner over! 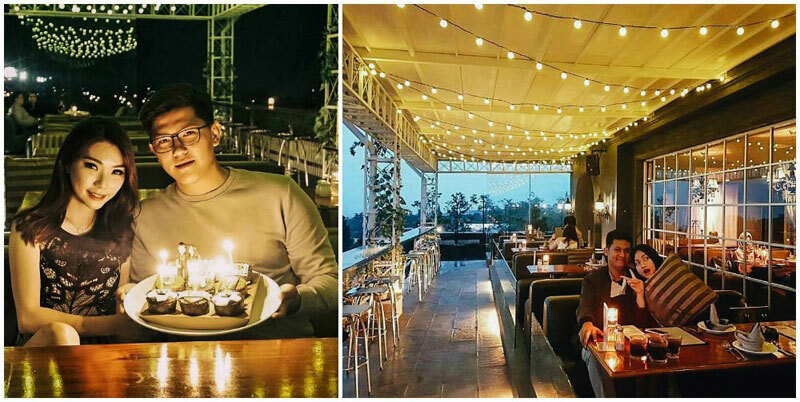 At Windy Point, you get the best of both worlds, having an indoor beautiful vintage dining area and a romantic open-air dining area where you can enjoy panoramic night views of Bandung! 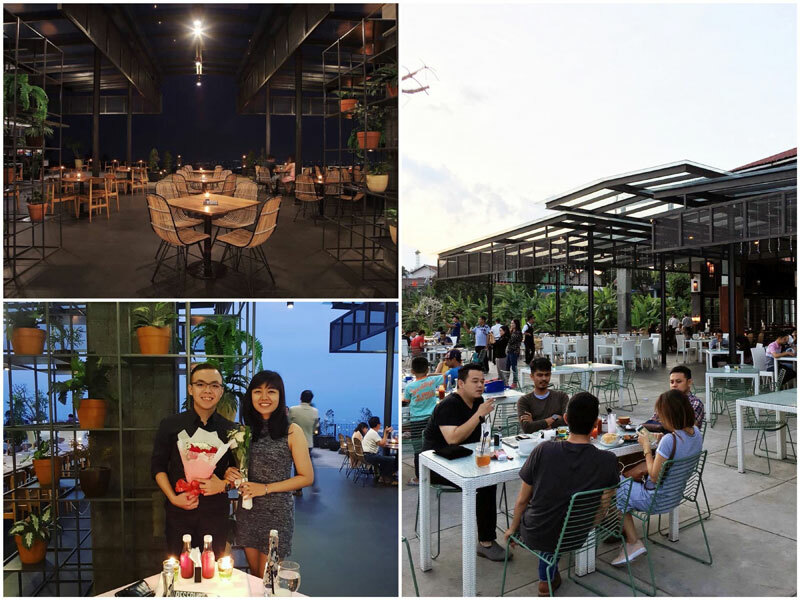 Not only is the outdoor area refreshing, but it is also really romantic, with the stars shining above you and your partner quietly without disturbances from the rest of the world. Be it an anniversary dinner or celebrating Valentine’s day, Windy Point will meet your expectations for the night! 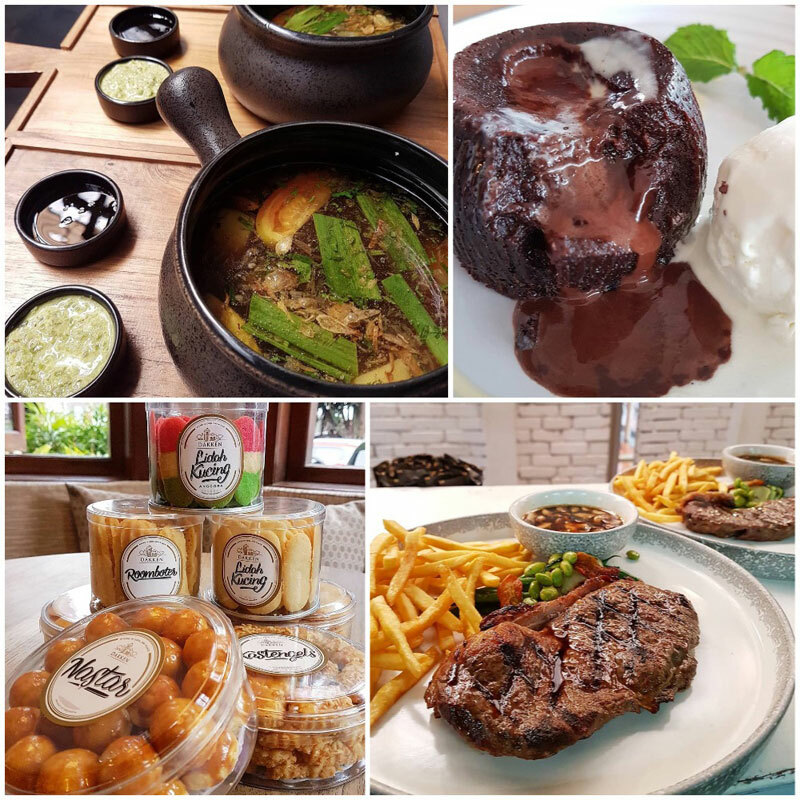 Match the romantic ambience with the crowd favourites, Chateaubriand Steak, and the Chocolate Melange – you simply can’t leave without trying them! With many couples making return visits to this restaurant, this can be the next hideout for you and your sweetheart as well! Have you found where you’re going to take your loved one on a romantic dinner date? 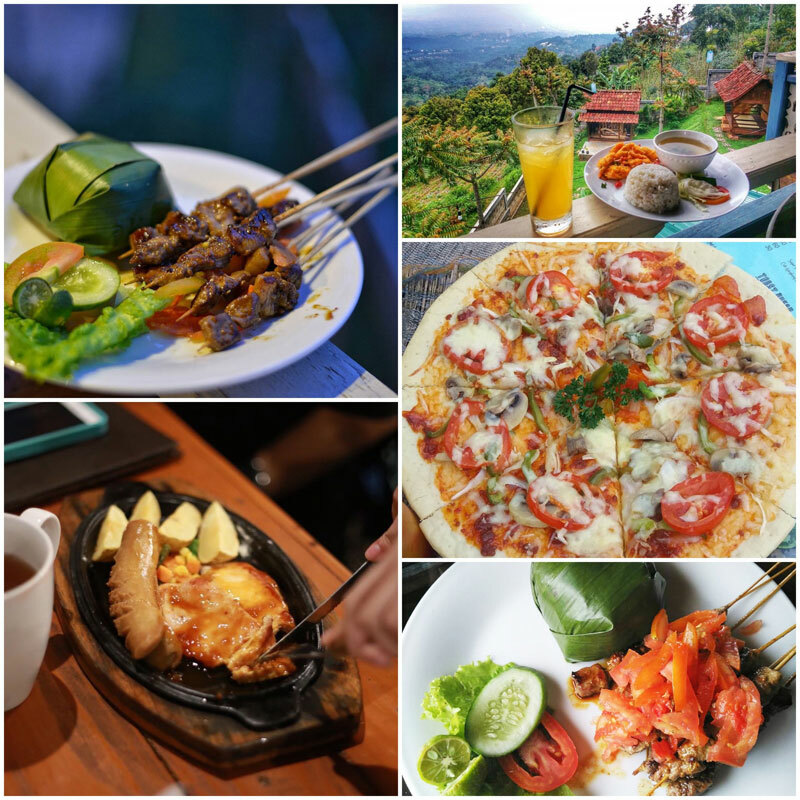 Or know of more affordable yet romantic restaurants in Bandung? Tag your date below!